Feminism, as we know it today, initially arose in the nineteenth century. Feminism was very much a cultural response to the industrialization of the Western World. As our civilization became more industrialized, the social contracts between the men and women begged for revision. The masculine attributes required for traditional roles, at the beginning of the nineteenth century, often required great sacrifices on the part of men. Men were universally exploited by ruthless governments, as disposable soldiers, and women benefited from this exploitation. Most men were expected to devote their working lives to gynocentric policies that afforded women special privileges in our cultures. In exchange for these privileges, and, to avoid the exploitation that men faced in our culture, women had avoided involvement in institutions that demanded life-changing sacrifices from men. As the industrialization, and mechanization, of our cultures advanced, women began demanding more and more involvement in institutions that had traditionally required the abilities and responsibilities that men had provided. In order for women to obtain the benefits of the involvement they sought in male dominated institutions, feminists discovered that if they could use guilt to manipulate men, and institutions, then, they could acquire all of the benefits of the industrial age without having to assume the same responsibilities as men. This “movement” led to the beginning of feminism, as we know it today. “First wave feminism” arose in the minds of early nineteenth intellectuals such as Mary Wollstonecraft. 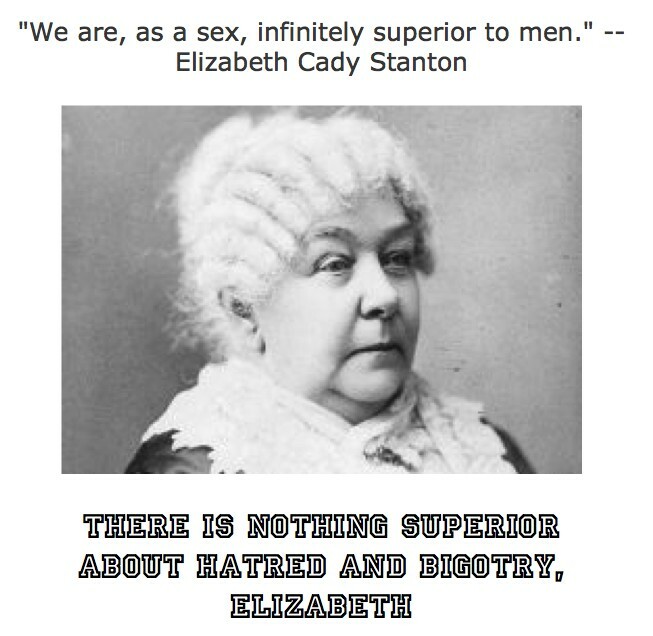 In her writings, she hypothesized that women’s “roles” in society were a result of deliberate efforts to deprive women of all of the benefits which men enjoyed. Her writings were convincing in that they exposed the differences between the gender roles in our cultures. They were incorrect as they uniformly omit all of the sacrafices to which men committed when they participated in male dominated institutions. Wollstonecraft saw male dominated institutions as playgrounds from which women were excluded. Those institutions, historically, however, were male dominated because their participation required enormous sacrifices and efforts from those men who participated in them. Wollstonecraft and her supporters, including the feminists of tday, ignore the fact that the disparities in gender roles, as far as benefits men supposedly received, also carried with them heavy responsibilities and burdens for men. Early “first wave feminists” found that by ignoring all of the responsibilities that men traditionally assumed because of their gender, feminists could persuade men and women alike to feel guilty, about the existing gender roles in society, that appeared to confer more benefits and powers on men than were extended to women. This led to numerous changes in the social contract between men and women. Those changes conferred the same “rights and privileges” on women that men “enjoyed.” Almost all of the responsibilities, however, under those ancient gender contracts, have remained for the men. Although this has been heralded, in revised history, as advancement for women, it has been, in fact, created a gynocentric, privileged class for women. Women now “enjoy” a privileged class in which they have all of the benefits that men have, but, few of the responsibilities that are required of men. Men are required to take risks under the old social contract. With the advent of feminism, that has now become an obligation on the part of men to be disposable in the interests of women and our society. Yet, the social contract was never changed to provide men with the necessary safety nets and social privileges to balance out the artificially imposed disposability. What feminism, and the rest of our culture refuse to recognize, is that we should not continue to impose responsibilities on men, because of their gender differences without, at the same time, honoring those gender differences and granting men balancing benefits for the 21st. century responsibilities we impose on them. As feminism continues to obtain advances for women under the gender social contract, without providing for balancing advances for men under the gender social contract, feminism has become a movement that is driven by pathological narcissism rather than any considerations of gender equality. Narcissism is a concept that originated in Greek mythology. Narcissus was a handsome young man. One day, while he was getting a drink of water at a spring, he glanced at his own reflection in the water and fell in love with himself. Like all of the ancient Greek myths, the myth of Narcissus represents an icon of a human archetype. By understanding the essence of the myth of Narcissus, we can see the presence of that archetype in others, and, label them narcissistic if they fit the recognizable patterns. Drawing upon these ancient archetypes, science has formulated a modern description of narcissists. This description is contained in a medical guide known as the Diagnostic and Statistical Manual (of the American Psychiatric Association). This model is intended to be applied against individual persons for the purposes of a medical diagnosis. However, it is also pertinent for application to a group’s collective ideologies, such as feminism, to expose those ideologies as being pathological, or, encouraging those individuals who subscribe to the pathological ideology to acquire the individual traits of the pathology. 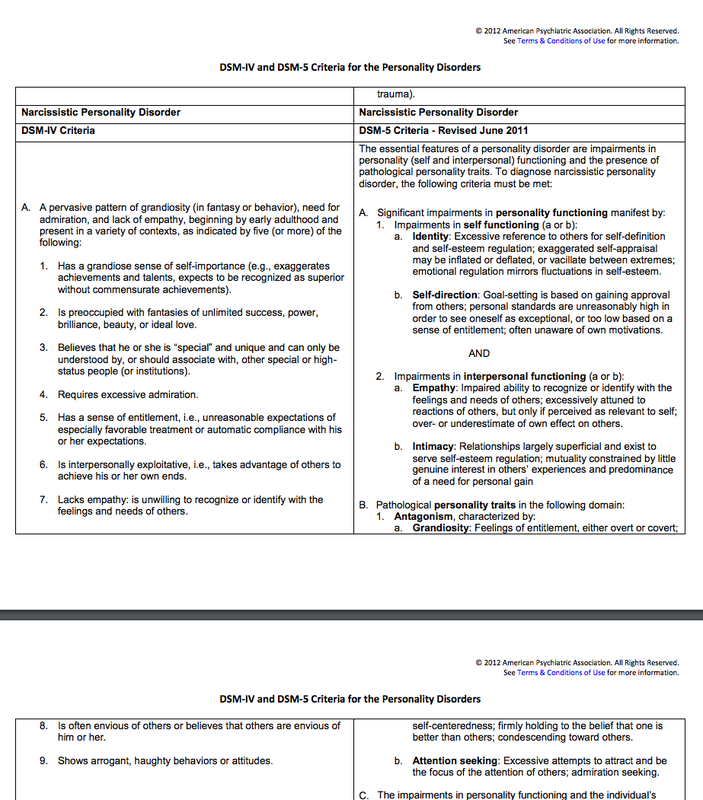 We cannot, literally, say that an entire movement has a pathological personality disorder, such as narcissism. We can, however, analyze groups of people in terms of the traits that they collectively demonstrate, and, analyze the ideologies as a reflection of pathology. For example, one intellectual describes feminism and it’s “social justice warriors” as a form of medical hysteria he calls “Collective Munchausen Syndrome.” The professor at Concordia University is not, literally, attempting to diagnose a medical condition for every single person who is in the implied group. Nevertheless, he demonstrates how the group, as a whole, demonstrates the characteristics of a pathological medical syndrome. In the same way, we can analyze a movement, such as the feminist movement, in terms of pathology, by examining how the movement as a whole presents the characteristics of a person who is properly diagnosed with the pathological disorder. We can also apply the analysis of pathology to the behaviors the ideology encourages its individual members to adopt. “First wave feminism” historically arose in early 19th Century Europe. Although there were threads of feminism in literature and government throughout human history, feminist principals were typically adopted only when (a) society could afford to indulge in gynocentrism, and (b) when society found it expedient to use feminism as a way to manipulate men. For example, in ancient Sparta, men were required to get married by the age of about 30 years old. They were punished if they refused to get married. This became the custom in ancient Sparta in order to serve the interests of women, and, also to serve the interests of the State. By forcing men to get married and have children, the State had a means of producing soldiers for the defense of the State. Needless to say, the State also imposed heavy burdens on married men to care for their families. To encourage men to get married, in addition to punishing them if they did not, and, to enable the men to effectively administer over their families to the benefit of the State, men were given authorities over the family in addition to the burdens that were placed upon them in regard to marriage. This gave rise to the cultural concept of “patriarchy.” The Father was responsible for everything involving the family, including the criminal conduct of his wife and children. Therefore, he was given the authority over wives and his children to insure the orderly contributions of the family to the State. During the 20th Century this societal structure acquired the label of the “nuclear family.” Throughout history, the “nuclear family” has stood the test of time as the strongest societal structure for both individuals and civilization. The nuclear family has stood, for many thousands of years as the bulwark against fascism and tyranny, and, at the same time, has insured the continued survival and development of the human race. In the 20th Century with the advent of industrialization and a change in structure of labor in the US and Europe, the nuclear family, and traditional gender roles, came under attack by political interests. Those interests gained from flooding the workplace with cheaper labor from women, and, from using hatred of men as a means of dismantling families, and, dividing men and women against each other to make both genders easier to exploit and subjugate. Without families, men and women consume more, pose less of an opposition to the elite, and divided against each other, men and women cannot form alliances that are favorable to individuals — the result is that the human population, especially in industrialized nations, has become easily controlled and manipulated for elite economic and political interests. To encourage feminists, and hatred of men, and, to divide men and women so that the are easily manipulated, feminist narcissism became an essential component of gender relations. Men are conditioned from birth to hold women in high esteem. It has been relatively easy, therefore, for the past five decades, for industrial cultures to convince men that any criticism of women (or feminists) is anti-social, and, no praise or condescension to women’s egos is inappropriately excessive. Needless to say, it was not difficult for mass media propaganda, the government and religion to convince women that they were not only men’s equals, but, their superiors in every way. Institutions found it highly profitable to inundate women with propaganda that fueled their gender narcissism like fertilizer applied to a flower garden. (Women “flowered” from this narcissistic fertilizer (but weeds also became prolific)); the “weeds” that were encouraged from the fertilizer of feminist narcissism became third wave feminism. In Part II, we will continue our analysis of third wave feminism as a factor driving not only narcissim, but a destructive form of gynocentrism and institutions that are saturated with misandry. Clementine Ford is a high profile feminist who was once an actor in a popular American television series known as “The L word.” She is a lesbian in real life and openly preaches contempt and violence towards men. Professor: Paranoid leftists suffer from “collective Munchausen syndrome” — The Rebel Media, http://www.therebel.media/professor_paranoid_leftists_suffer_from_collective_munchausen_syndrome (January 25, 2017).